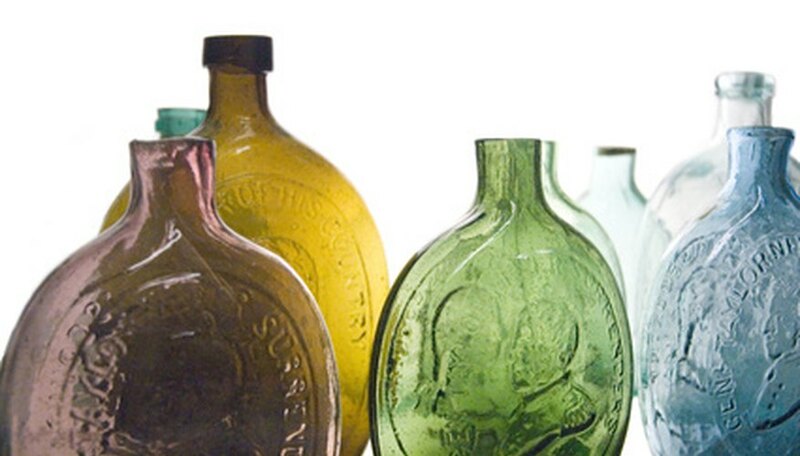 Antique bottles come in all colors, shapes and sizes. They retain popularity with collectors for their curious and varied styles. The embossing and imprints used by early manufacturers and glassblowers adds to their allure. The combination of these attributes and their historical significance makes vintage glass bottles a great educational tool for collectors of all ages. Antique bottles were used to store medicines, ink, whiskey, beer and other types of alcohol, milk, soda or perfume. Each type of bottle has a different shape or size. Flasks contained whiskey or spirits and came in three basic shapes: rectangular, cylindrical or decorative. The latter often sported elaborate scrolls, sunbursts or patriotic emblems, such as the American Eagle or a political figure. Soda and water bottles resembled today’s soda bottles, albeit made with thicker glass and often contained the name of the product or manufacturer stamped or embossed in the glass. Medicine bottles were smaller, and came in rectangular or cylindrical shapes. The avid collector knows where to find antique bottles without getting his or her hands dirty. There are antique shops, flea markets, bottle collector shows and clubs, eBay and busy bottle collector forums on the Internet. However, collectors find unusual and rare bottles by searching through old campsites, roads and abandoned homes and barns in the countryside. The Northeast and Midwest yield particularly old bottles, especially ones that contained milk and medicine. Antique and collectible bottles, which date back to the early 1800s were handmade by glassblowers in a variety of colors. The oldest bottles tended to be black or amber. Beer was commonly stored in brown bottles. The brighter colors--blue, purple, yellow and green--are considered by collectors to be the most valuable. They were mostly used for perfume bottles, but you will find the occasional vivid spirits bottle. Milk glass (also known as opaque white glass), used for toiletry and cosmetic bottles, achieved its highest popularity from the 1870s to the 1920s. Clear (colorless) glass held soda, milk or mustard, and appeared most often in antique bottles from the 1910s to the 1950s. The base, or bottom of the bottle, will give a collector pertinent information about its origin. A mouth-blown (older, handmade) bottle has a side seam which stops on the lip or neck of the container. Bottles may have a free-blown base shaped by the glassblower without the aid of a mold or a base made from a number of different molds. Machine-made bottles have a side seam that runs to the edge of the rim. Machine-made bottles with this type of rim were introduced in the early 1900s. The lip that surrounds the opening offers collectors insight into the age and origin of the piece in the same way the base yields information. Hastily made or uneven lips indicate an early, hand-blown bottle, pre-1870. A blob, or round-tapered lip, was used on soda and beer bottles between 1847 and 1920. A lip with a smaller one (double-tapered) underneath to hold wire that held the cork in place on beer and ale bottles was made prior to the 1870s.